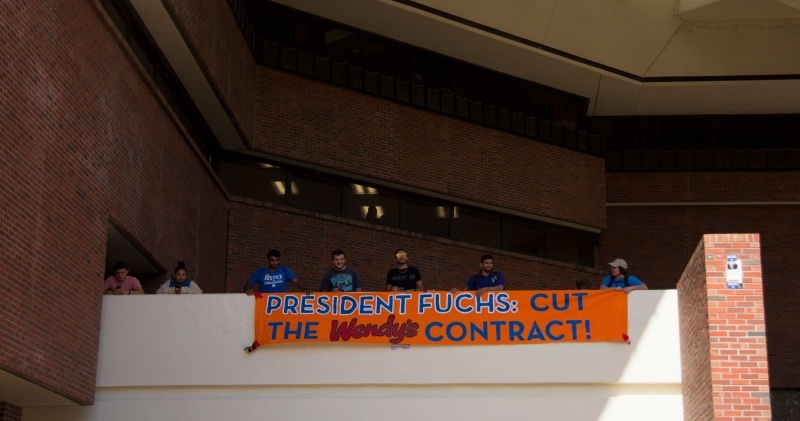 Students at the University of Florida turn up the volume on President Fuchs to cut the university’s contract with Wendy’s during the 4 for Fair Food Tour in March 2019. On the heels of this month’s momentous 4 for Fair Food Tour and with a just few more weeks left in the spring semester, the leaders of Student/Farmworker Alliance network ramping up pressure in the Wendy’s Boycott! On Thursday, April 18, students and young people will be coordinating banner drops and direct actions on campuses and cities nationwide, bringing to light the conspicuous absence of effective human rights protections in Wendy’s supply chain — and demanding a true commitment to Fair Food. Here below is SFA’s official call to action, detailing how you can make sure the campus in your community makes the list of participating schools and communities. Please share with your networks far and wide, and we’ll see you in the streets on April 18! 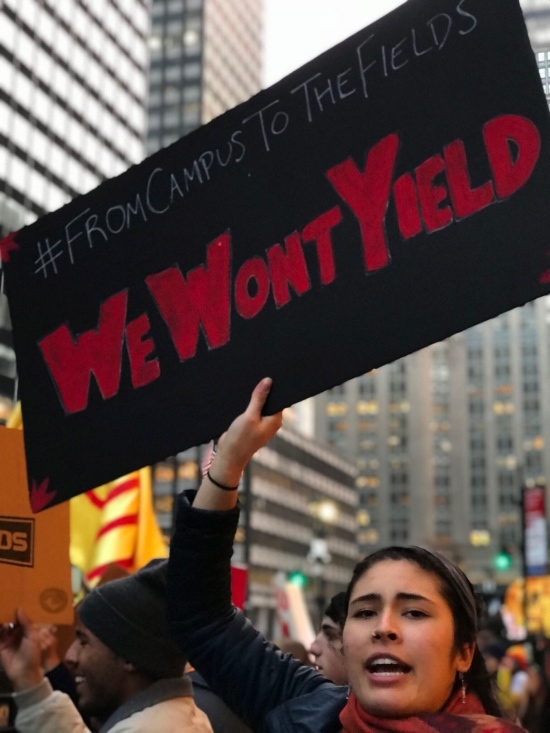 Following months of escalating action in the boycott — including a major “Boot the Braids” victory by students at the University of Michigan — Wendy’s flagrant disregard for the safety and wellbeing of farmworkers is only fueling consumers’ outrage. And on April 18, the SFA network will turn indignation into action, making it crystal clear to Wendy’s – and top university leaders who have chosen to still do business with the fast-food holdout – that we will not yield until a Fair Food Agreement is signed! Let us be clear, Wendy’s. Young people are not craving “customization, speed, and convenience.” We are craving transparency, fair wages and human rights for farmworkers! Join the SFA network on Thursday, April 18, for a National Day of Action, where dozens of youth on campuses from coast to coast will drop protest banners and organize direct actions to demand Wendy’s show respect for farmworkers and consumers, and finally join the Fair Food Program. Students at the University of Florida drop a banner during the 500+ strong 4 for Fair Food march through campus in March 2019. Check out SFA’s action toolkit [LINK], and be on the lookout for added resources this week on creative banner ideas, talking points, and more! If you’re ready to jump in, get in touch with us at organize@sfalliance.org or call 239-657-8311.